It’s hard to live in Cincinnati without following Tide laundry detergent—at least for a branding and design professional. Initially introduced in the 1940’s “America’s Washday Favorite” has become an iconic brand and a laundry room staple. But do clean clothes equal stylish living? The newest advertising from the America’s best selling detergent believes the category isn’t just about getting clothes clean, it’s about making you look good. With the campaign theme “Style is an option. Clean is not.” leading the messaging, Tide brand management and Publicis Groupe’s Saatchi & Saatchi are speaking to what is most relevant, looking good is important. In an economic downturn, taking care of the clothes you already own may be even more important. Sounds like a safe bet. 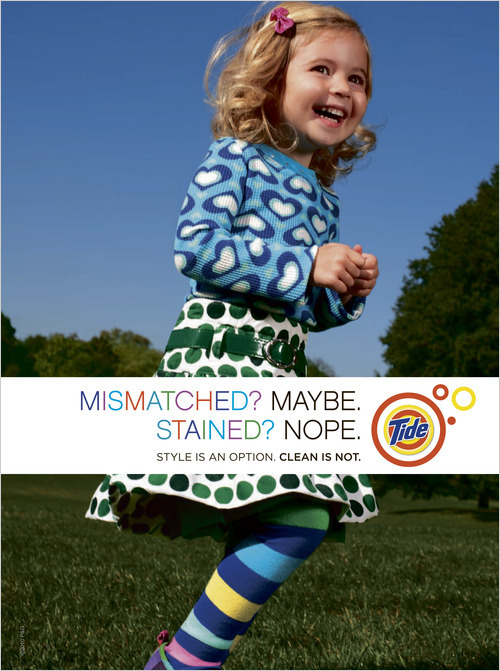 Advertising – Tide Links Clean Clothes With Stylish Living – NYTimes.com.